Explanation: You have to take a long hike to see the Troll's Tongue -- ten hours over rocky terrain. And in this case, it took three trips to capture the landform below a clear night sky. Trolltunga itself is a picturesque rock protrusion extending about 700 meters over mountainous cliffs near Lake Ringedalsvatnet in Norway. The overhang is made of billion-year-old Precambrian bedrock that was carved out by glaciers during an ice-age about 10,000 years ago. The featured picture is a composite of two exposures, a 15-second image of the foreground Earth followed 40 minutes later by an 87-second exposure of the background sky. Thousands of discernable stars dot the backdrop starscape in addition to billions of unresolved stars in the nearly vertical band of our Milky Way Galaxy. So whose backside is the troll tasting? Nice shot imo. Is that Jeb Corliss or Jokke Sommer laying on the Tongue? Why a 40 minute delay in images? Weather??? 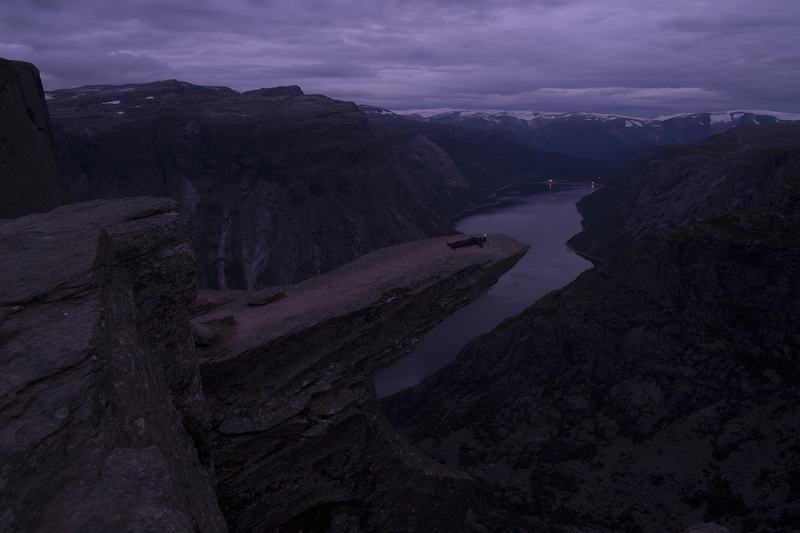 I should be very wrong but there is no bridge to be seen at Trolltunga. What else is assembled in this "photo"? Ummm... 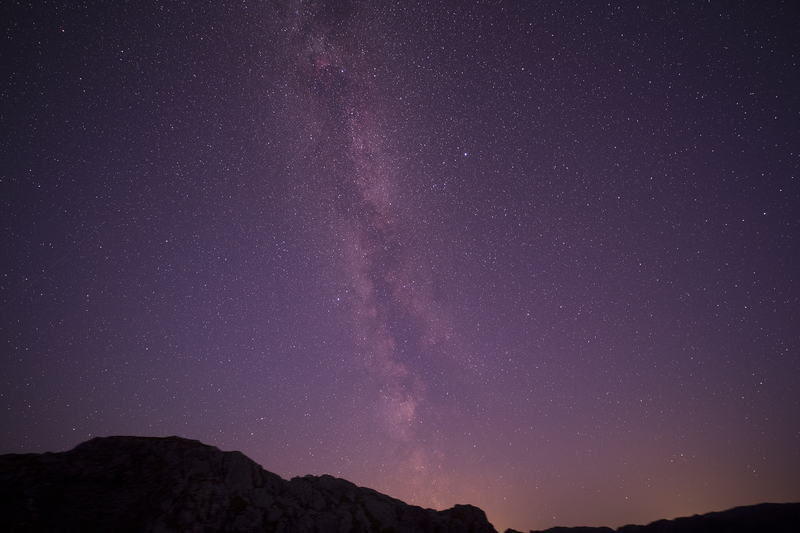 I'm pretty sure you can't get a near-vertical image of the Milky Way from Norway! I suspect the background was shot somewhere around the equator?!?!?!? There is no bridge in this picture. Just a distant shore with a couple of lights along it. Sorry sorry, I was wrong. By magnifying I am see it myself. I am so sorry! Wow. There is such cloud cover in the foreground picture, It seems incredible that they got a clear Milky Way shot 40 minutes later. 700 meters?? It looks more like 70 meters. The part sticking out looks to be about 40 meters. Or did you mean that it is 700 meters above the Valley floor? Yeah, either way - a typo for length or grammar confusion to imply height above the valley floor. I happened to choose the latter. Vertical is more the nighttime norm around this time of year. The best way I found to show this is using a composite of Google images showing both terrain and sky. The date/time range is very broad but to display the nominal MW orientation, the time stamp is Sep 9, 2:41am. Also, given the observation position, the field of view is constrained in Google Earth and GE fails to show the rock outcropping, but the lake and mountains recreate the APOD view pretty well. Interestingly, I can't get the MW to lean to the left as much as the APOD (for that view heading). That and funny constellation orientations I have to attribute that to distortion.